Glistening white shrink wrap as far as the eye can see, straight and uniform welded joints, not a wrinkle in site, all under a cloudless blue sky and installed in minutes. If you read the websites of most scaffold shrink wrap suppliers, you would be forgiven for thinking that scaffold shrink wrapping was a perfect solution to every temporary sheeting problem. However, when reality does not match up to those perfect photos and accompanying slick ‘sales patter’, new customers can end up disillusioned with shrink wrapping. Here then are the 3 most common scaffold shrink wrap problems and how you can solve them. The scenario goes like this; you are on a construction site shrink wrapping a scaffolding and you have welded the shrink wrap around a scaffold tube to secure the sheeting in place. All looks good. However, a few hours later you start to notice the welded joint is peeling apart and you can easily put your hand between the two pieces of shrink wrap film and seperate them apart further. This is a potentially serious problem because it is the welded joints that secure the temporary shrink wrap sheeting to the scaffolding structure so without these joints, the shrink wrap is going to lose it’s tension, start to flap and then potentially blow off if the winds are strong enough. 1. User Error: To get a strong joint or ‘weld’ between two pieces of shrink wrap film it is important to heat both pieces of film with the heat gun sufficiently, so that each piece of shrink wrap reaches it’s ‘melt point’. At this point, when the two pieces of film are pressed together (using leather welding gloves) they should be completely bonded. To help with this, scaffold shrink wrap installers try and get the hot air gun right between the two pieces of shrinkwrap, pressing the wrap together, and then immediately heating the joined area again from the outside. Inexperienced scaffold wrap installers may not give the weld enough heat or they may allow the joint to get wet or very dirty before attempting to heat weld it. Solution: Always make sure the shrink wrap is clean, dry and overlapped by 30-40cm before heat welding together. When making a shrink wrap weld try and minimise any wrinkles and air bubbles inside the weld because in a wrinkled and bubbled area, the wrap will not be bonded properly and this will make the joint significantly weaker. Solution: Ask your shrink wrap supplier for a technical datasheet. Ask them if they know what % of HDPE and MDPE is added to their shrink wrap film. Ask them to supply you some film from current stock and make a quick test yourself. A common problem can be seen during the heat shrinking process. Whilst you are passing the hot air from the propane shrink wrap gun over the film to shrink the film ‘drum tight’, (like spray painting), tiny holes appear and then grow larger as the shrinking of the film pulls them apart. 1. User error: If a roll of scaffold shrink wrap film is dragged along the ground, repeatedly dropped prior to installation, or snagged on protruding scaffold fittings as the sheeting was pulled over the scaffolding, the damage can appear as tiny holes which get larger as the shrink film us shrunk tight. Solution: Ask your supplier to ensure your rolls are supplied individually wrapped so that they are protected until the time comes to install them. Always handle new rolls of scaffold wrap carefully and be carefull of snagging until the shrink wrap sheet has been clipped and heat welded into position. 2. Technical problem with the shrink wrap film: In addition, if the shrink wrap film has not been manufactured and specified for scaffold shrink wrapping it may not have the correct additives. Solution: Get a datasheet from your supplier. Ask them to supply you with a free sample of shrink wrap from current stock and test it yourself. After completing the scaffold sheeting heat shrink process you may notice thinner or transparent areas in the white film. This is most visible from the inside when the light is shining through the shrink wrap from the outside. 1. User error: To shrink the scaffold sheeting the installer must pass the hot air generated from the shrink wrap heat tool, over the scaffold wrap film in a consistent way. If you heat an area excessively then the plastic wrap will become thin and even eventually create a hole. Solution: Holding the hot air gun 30-40cm away from the sheeting, pass the heat consistently so that the whole sheet is consistently heated. Make sure the weather conditions are appropriate. 2. Technical problem with the shrink wrap film: When discussing shrink wrap welds above we touched on the manufacturing process which involves extruding a ‘bubble’ of shrink wrap film. The control of the thickness of this bubble is critical. Often, shrink wrap film for scaffold wrapping may be manufactured by companies who mostly make plastic films for agricultural use and which generally does not require sophisticated manufacturing processes. Solution: The control of the shrink wrap films thickness must be computer controlled. Ask your scaffold shrink wrap supplier for a datasheet or specification for the shrink wrap they are supplying. Ideally, you need to look for ‘average thickness’ or ‘spot thickness’ of the film with a +/- variation of 10% or less. In this post we have looked at the 3 most common scaffold shrink wrap problems and explored some ways to solve them. If you would like to learn more about the scaffold shrink wrap installation process download our free guide; How To Shrink Wrap Scaffolding. No Heat / No Naked Flame Shrink Wrapping – Can It Be Done? Printing on Scaffold Shrink Wrap – What Are My Options? 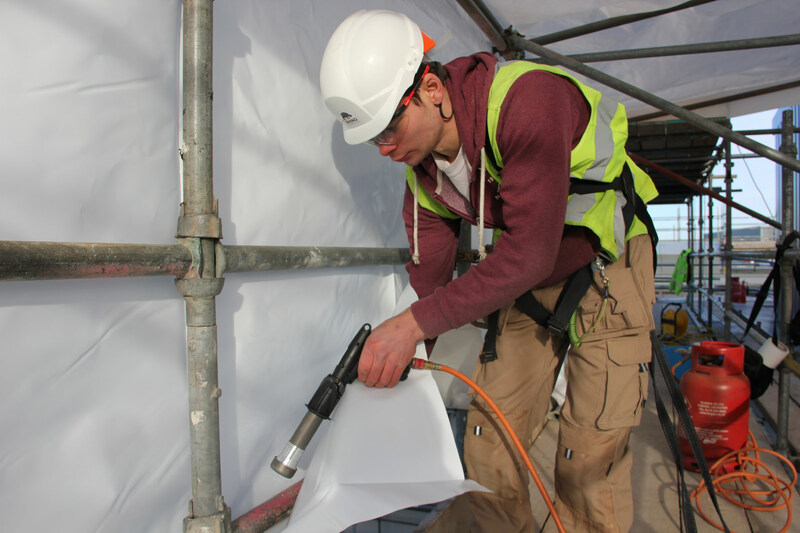 Can Shrink Wrap Provide Noise Reduction On Construction Sites? Do scaffold shrink wrap installers deserve more recognition?